The True Bloods are in disarray, their alliance crumbling and their armies humbled by the forces of the Black Road. Aeglyss, falling ever deeper into madness, casts a shadow across all. At the court of the High Thane, Anyara faces a savage struggle for survival against the na'kyrim's possessed agent: Mordyn Jerain, the Shadowhand. In the Glas Valley, Kanin, the embittered Horin-Gyre Thane, plots a desperate rising against the halfbreed. But ultimately it will be Orisian, Thane of a Blood that no longer exists, who must stand face to face with a darkly transcendent Aeglyss and make the sacrifice - of himself and others - required to end the threat he represents. 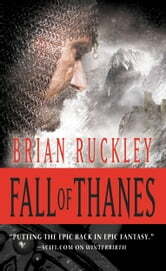 FALL OF THANES is the spectacular conclusion to the Godless World trilogy, a sweeping epic of war, politics and empire. No spoilers, I just think it is a well written work and a fitting end to an excellent series. I would enjoy visiting this world again if any further books were done.